Great For a Light Lunch! I have been bringing salads to work for lunch for about a year now. Usually it's a classic salad with romaine lettuce, grape tomatoes, shredded carrots, black and green olives, croutons, and chic peas. I make my own dressing with organic raw apple cider vinegar, extra virgin olive oil and a lemon dill seasoning. It is so refreshing and extremely good for you. I am really surprised that I haven't gotten sick of eating salad everyday yet. This past week I changed things up a bit, however. Not because I didn't want my usual salad, but because I forgot the romaine this week. Also, my friend and avid gardener extraordinaire, Jen, has been supplying me with fresh cucumbers and tomatoes from her garden. So I decided to feature the cucumbers and tomatoes along with my usual protein packed chick peas. I pretty much just adapted the recipe on the back of the Goya Chick Pea can. It turned out delicious, light and refreshing! Toss all ingredients together and refrigerate until chilled and flavors combine. I love chickpeas, so I think I would love this salad. I made hummus the other day! I love chickpeas. They are a great source of easy protein!! 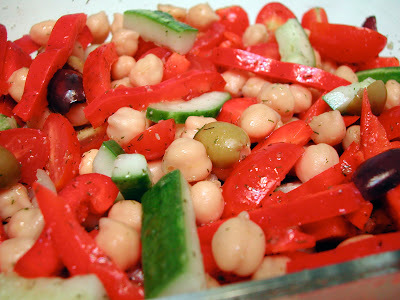 I love chick pea salad.I have made a very similar salad. I adore chickpeas--so I'm definitely going to try this one! it looks fantastic! I'm already hooked on your 3 bean salad, now it looks like I'll be hooked on this one! Looks great! What a beautiful looking salad. Just what we need around our house to try to eat more vegetables!! I am so going to make this for Sunday BBQ. What should I use if I don't have lemon-dill seasoning?